PHILADELPHIA (AP) -- The district attorney announced Wednesday that prosecutors will no longer pursue the death penalty against former Black Panther Mumia Abu-Jamal, meaning he will spend the rest of his life in prison for gunning down a white police officer nearly 30 years ago. The decision by District Attorney Seth Williams, made with the support of the officer's widow and the city police commissioner, comes after nearly 30 years of legal battles over the racially charged case. Abu-Jamal was convicted of fatally shooting Philadelphia police Officer Daniel Faulkner on Dec. 9, 1981. He was sentenced to death after his trial the following year. Abu-Jamal, who has been incarcerated in a western Pennsylvania prison, has garnered worldwide support from those who believe he was the victim of a biased justice system. The conviction was upheld through years of legal appeals. But a federal appeals court ordered a new sentencing hearing after ruling the instructions given to the jury were potentially misleading. The U.S. Supreme Court declined to weigh in on the case in October. That forced prosecutors to decide if they wanted to again pursue the death penalty through a new sentencing hearing or accept a life sentence. The officer's widow, Maureen Faulkner, has tried to remain visible over the years to ensure that her husband is not forgotten. They were newlyweds when he died. According to trial testimony, Abu-Jamal saw his brother scuffle with the 25-year-old patrolman during a 4 a.m. traffic stop in 1981 and ran toward the scene. Police found Abu-Jamal wounded by a round from Faulkner's gun. Faulkner, shot several times, was killed. A .38-caliber revolver registered to Abu-Jamal was found at the scene with five spent shell casings. 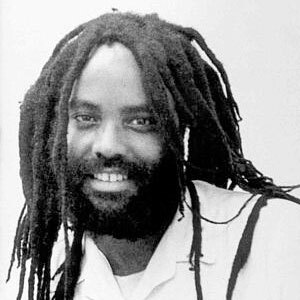 Abu-Jamal, born Wesley Cook, turned 58 earlier this year. His writings and radio broadcasts from death row made him a cause celebre and the subject of numerous books and movies. His own 1995 book, "Live From Death Row," describes prison life and calls the justice system racist and ruled by political expediency. Abu-Jamal, a one-time journalist, garnered worldwide support from the "Free Mumia" movement. Hundreds of vocal supporters and death-penalty opponents regularly turn out for court hearings in his case, even though Abu-Jamal is rarely entitled to attend. His message resonated particularly on college campuses and in the movie and music industries -- actors Mike Farrell and Tim Robbins were among dozens of luminaries who used a New York Times ad to advocate for a new trial, and the Beastie Boys played a concert to raise money for Abu-Jamal's defense fund. Over the years, Abu-Jamal has challenged the predominantly white makeup of the jury, instructions given to jurors and the statements of eyewitnesses. He has also alleged ineffective counsel, racism by the trial judge and that another man confessed to the crime. Do we think the newly elected DA, Seth Williams being a black man had anything to do with this decision considering that he is the first black DA in PA? Should we be asking for a complete pardon in this case or is dropping the death penalty enough?